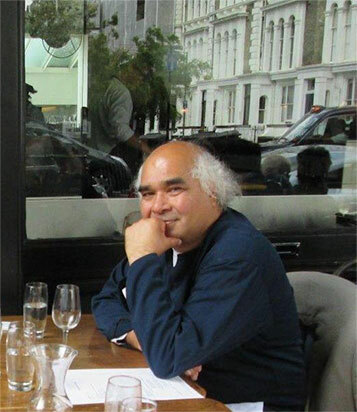 Kapil Jariwala is an independent curator and art dealer specialising in Oceanic, Indian, Tribal and Contemporary art. He was born in Surat, India and moved with his family to England in 1962 via Nigeria. At the age of 14 a chance advert in a news agent’s window in Twickenham for a Saturday job led him to work for Maria Langlois as a gardener and eventually to help out in her antiques shop – she became an inspirational mentor and encouraged his interest in painting and his growing fascination with antiques and collecting. He went on on to study painting at Chelsea School of Art and after graduating he took his Masters in Art History, becoming a lecturer at Chelsea School of Art and the London College of Printing and a visiting tutor at various art schools and universities, all the time maintaining his practice as a painter and exhibiting widely. In 1986 he opened his own gallery running it from his home in south London, moving to larger and more central premises in Hoxton and then to Butler’s Wharf by Tower Bridge in 1990, eventually in 1994 he moved the gallery to the west-end in New Burlington Street and then to New York in 2000 where he ran Culture Gallery in West Broadway. He returned to London in 2004 curating exhibitions in pop up gallery spaces and public venues. At each of these locations over the years he has mounted a succession of exciting exhibitions that embraced an eclectic range of art, the exhibition programme has a strong commitment to contemporary art interspersed with historically themed shows which has included: Alfred Wallis – Cornish Primitive, Kashmir Shawls, Tantra – Art Ritual Ecstasy, The Art of War-Tribal and Oceanic Weapons and Shields and Early American Quilts. In 2010 he co-curated The Indian Portrait 1560-1860 with Rosemary Crill from the Victoria and Albert Museum at the National Portrait Gallery, London. Throughout the gallery’s history there has been a strong interest and a passion for abstract form both as a lingua franca and a bridge across cultural and artistic divides. Regarding his activity as a dealer he was once asked how he would best describe his occupation, without hesitating he replied – I sell water by the river.